It is certainly that time of year to whip up recipes with squashes, pumpkins, sweet potatoes, etc. The change in weather begs for heartier plates. And, this recipe is not messing around. It is protein driven and stick to your ribs filling. The sweetness of the asian squash pairs very nicely with the earthiness of the lentils. Keep in mind this recipe is going to taste more like an Indian curry rather than a Thai curry. If you are not familiar with the kabocha squash, it can also be referred to as a Japanese pumpkin that is in season late summer and early fall. So right now they are at their peak! So what are you waiting for? Pick some up and lets get cooking! I also love keeping the seeds, cleaning them and then baking them. A great little snack for the fall! I also love when you are able to use the outside of a vegetable as a serving vessel. I just feel like it honors the produce that much more. If you follow this recipe, keep in mind this can be served family style. One entire stuffed squash will easily fill up 3-4 people. Preheat oven to 400. Lightly oil the cleaned out kabocha squash and bake in oven for roughly 45 minutes or until a knife can be softly inserted into the flesh. Check for done-ness around the 30 minute mark to gauge how much longer you have to bake. Once done, let cool until able to handle. In the meantime, bring your water or broth to a boil, add in the lentil, turn to low and simmer for 30-45 minutes or until tender and the liquid is absorbed. Note, older lentils may take longer and red lentils should only take about 20 minutes. Once the squash is cooled down, scoop out the flesh carefully, making sure the outer shell remains in tact. Place 75 percent of the flesh in a blender, add in coconut milk, starting with just 1 cup and blend. Check consistency and add in the remaining coconut milk if desired. Set aside. With a large saute pan, heat evoo and add in garlic and ginger. Saute for about 2-3 minutes and add in chopped green bell pepper. Saute for an additional 2-3 minutes and then add in kale. Saute for about one minute. Add in cooked lentils, squash puree and all the seasonings. Mix thoroughly. Add in more spices to your taste. Scoop the mixture into the shell and serve! Breakfast for dinner? Or, dinner for breakfast? You can have it both ways! Main dish? Or, side dish? Ahhh you can have it both ways as well! So versatile! The most important step in this recipe is removing the excess liquid of each vegetable by compressing the shredded items with paper towels until almost all the liquid is removed. Warning, make sure you have plenty of paper towels on hand! If you have a food processor, use it for this recipe! This makes shredding all the items painless and speedy. So, if you are not familiar with rosti, it is traditionally a Swiss dish consisting mainly of potatoes. This like a large hash brown pie or latkes. I chose to add in fresh corn, zucchini and onion to spice things up a bit. Seasoned with perfection and this recipe is banging! I made this for dinner and was surprised how great it is. I woke up the next morning, and head straight for the refrigerator and warmed up a piece for breakfast. Preheat oven to 400. Bring a large pot of water to a boil, shuck your corn, and boil both the ears of corn and peeled potatoes for about 3-5 minutes. Remove from boiling water and set aside. While the corn and potatoes are cold, shred the zucchini and onion in a food processor. Remove and press with paper towels until most of the water is removed. Now, put the potato through food processor and do the same thing- squeeze out the water from the potato. At this point, the corn on the cob should be cool enough to handle. Take a very sharp knife and carefully cut off the corn kernels. In a large bowl, mix all ingredients together thoroughly. Toss is seasonings and evoo and mix again. Lightly oil a pie pan, and spoon your mixture in evenly. Bake in the oven for 1 hr to 1 hr and 20 minutes. Allow to cool for about 5-10 before serving. This is a great energizing pasta dish that will melt in your mouth, and satifying but without feeling super guilty. It will beg you to take just one more bite. I think it is pretty cool taking a dairy based cream sauce and using vegetables to create something similar to the traditional taste of the item. Even if you are not a fan of cauliflower, you should still try this recipe. The cauliflower flavor is subtle to not even present. It has that nutty, more cheese-y flavor due to the nutritional yeast and miso paste. If you are pressed for time, I would recommend boiling the cauliflower instead of roasted it. This will chop out 20-25 minutes of your total cooking time. Preheat oven to 425. Toss chopped cauliflower and garlic cloves in evoo and bake for about 30 minutes. Remove from oven. Transfer the a high speed blender and add in everything but the peas and rigatoni. Blend until smooth. Add in more almond milk if too thick. Season to taste. Transfer to a sauce pan, and heat on low and toss in peas. In the meantime, cook your pasta. Drain pasta, add in sauce and bam! Heaven in your mouth. 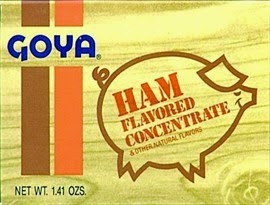 Vegan Szechuan Green Beans with "Pork"
There is no joke about Goya's Ham Flavored Concentrate! If you want to emulate that smokey ham or pork flavor, do not pass up this product. And, it is pretty easy to find. I see it at literally every bodega around me. This is a perfect side dish to accompany your favorite Asian entree. A slightly salty, sweet and spicy recipe. A generous tablespoon of sambal or fresh chili sauce gives it just enough heat to awaken and excite your tastebuds! And, it is easy as can be. If you do not have a wok, no worries, just use a saute pan and heat oil on high. In a small sauce pan, bring the water with the "ham" concentrate to a boil. Stir in tvp, turn off heat and let tvp rehydrate for about 10 minutes. In a wok, heat oil(s) on med-high, add in garlic and saute to for one minute, Stirring frequentaly. Add in green beans and toss them in wok for about 5 minutes or until they are slightly tender. Toss in your sauce, mixing thoroughly, add in the tvp and mix everything together. That's it! Enjoy! A Whole Lotta Chocolatta!.....Vegan Double Chocolate Chip Cookies! Holy (not so) cow! These cookies are to die for! And this is coming from a girl who does not enjoy sweets often. So decadent and chocolaty! Seriously cozy up with a blanket, a good movie, a nice cold, tall glass of almond milk and dunk away! Sadly enough this was the first time I used my Kitchen Aide mixer....and I have had it for four years...shame on me. I think that just tells me I have too many toys in the kitchen. But, it was pretty exciting to use, and I look forward to using it more frequently in the future. When making these cookies, there is one important thing to note. Once you are finished making the cookie "batter", it will seem a bit dry and almost grainy. This is normal! Do not add more liquid or oil! You are going to spoon up each cook and compress it into a ball and then press it down into a cookie shape. This is not your typical cookie batter! Also note, in order for this to be vegan, you must buy dark chocolate morsels! Preheat oven 350. In one bowl, mix together flour, cocoa powder, baking soda and salt. Set aside. In your mixer bowl, add in the coconut or vegetable oil, sugars, vanilla and start your mixer. Slowly mix in the almond milk and the contents of your other bowl. Mix until fully combined. Then, add in the morsels. Lightly oil your cookie sheet. With a spoon or ice cream scooper, scoop out a ball of the cookie mixture, form into a ball, then press onto the cookie sheet to form a cookie shape. Repeat until dough is gone. Bake for 12-14 minutes. The edges should be firm, and the centers soft. Let cool for a few minutes, then remove from cookie sheet. Enjoy! These are irresistible! This is a great vegan chili that will satisfy anyone's tummy. I have a few different chili recipes, but this one is definitely the most filling. This is a great meal on a cool, rainy day or if you want to pack in a whole lot of protein! One serving of this chili gives you over 30 g of protein! Sign me up! But, beware! This chili is filling! What is great about chili is that you can add an array of vegetables. For this particular recipe, I included carrots, onions, fresh vine ripe tomatoes and zucchini. I was thinking about adding in bell peppers as well, but I knew Ry would just pick around them, so I refrained. Best part about this recipe? Well, clearly it tastes amazing but literally anyone can make this! It is easy peasy with little skill required. So get your bums in the kitchen and make some chili! P.S- This is a perfect pot luck item to watch some football with your friends! Place the quinoa and broth in a small pot, bring to a boil, then cover and simmer for about 15 minutes. In the meantime, heat evoo in a large pot and saute the garlic, carrots and onions for about 3-5 minutes or until the onions are translucent. Add in zucchini and saute for an additional 3-5 minutes. Add in the remaining ingredients and seasoning. Adjust the seasoning if need be. Once the quinoa has finished cooking, add it to the pot. Add in the desired amount of vegetable broth. Cover and let the chili simmer for about 30 minutes. This will enable all of the flavors to really immerse. Serve when ready to eat. While technically it is still late summer, you would have no idea here in Chicago. It feels more like November around here. It has been in the 40's/50's and rainy. Ummm, no thanks. This weather just begs for a comforting fall dish! We were on a mini vacation last weekend and hit up some more U-pick farms (which may possibly be my most favorite activity). I picked an abundance of succulent peaches and Michigan apples. On top of that, I still have a ridiculous amount of produce from another trip to an Illinois farm a week prior. With that said, I really needed to come up with something that involved kale, red cabbage and apples. So clearly it is time to get cooking! 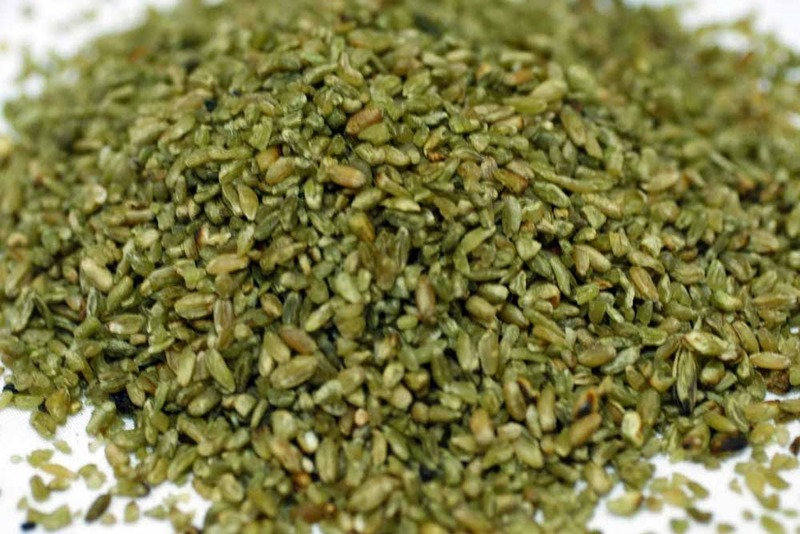 If you haven't heard of freekeh, you are not alone! I came across the grain by navigating the bulk section of my local grocery store. Then, one night Ryan came across a food trivia game. The question was "What is the oldest grain used for food". For some reason, I said freekeh. Ding ding ding. Oddly enough, I was correct. I found that pretty cool. It is now considered the "newest-oldest superfood". It is chewy, with a nutty flavor...think somewhere between barley and brown rice. The nutritional value is quite impressive too! It is a great plant based protein and high in fiber. So while quinoa has been on the rise, don't forget about other terrific protein blasted grains as well! Of course any squash is perfect for the fall. A little sweet, a little nutty...hmmm that kind of sounds like a description of me :/. Anyway, it tastes great with the nuttiness of the freekah, sweetness of a fresh picked fuji apple and the bitterness of kale and cabbage. Preheat oven 400. With a sharp knife, cut acorn squash in half, spoon out seeds, and cut off about a 1/2 inch of the bottom of each squash, so they stand up straight. Lightly brush evoo each squash and sprinkle with evoo. Bake in oven for about one hour or until you can easily place a knife through the squash. In the meantime, bring the vegetable broth and freekeh to a boil, cover, turn to low and simmer for about 45 minutes. When the freekeh is done cooking, transfer to a mixing bowl. Add in chopped kale, cabbage, apples, scallions and parsley. In a small bowl, whisk together the lemon juice, evoo, vinegar, nutritional yeast and s+p. Pour the dressing over the freekeh salad and mix together. Remove the acorn squash from the oven, spoon in the salad mixture, garnish with more fresh parsley and serve. Enjoy! Vegan Ginger Scented Cauliflower Fried "Rice"
I love the aromatics when I cook. It is basically mouth watering love flowing in the air. And, there is always something special about walking through the door and just smelling what is waiting for your taste buds. Almost like that smell when you walk into a Whole Foods, but...oh wait, I still have money in my bank account because I use my local grocer (ok, fine...most of the time). The aromas of ginger and garlic filled my kitchen, along with a touch of toasted sesame oil/chili oil. At that moment, I knew this recipe was going to be fantastic. Ginger root is one of my all time favorite ingredients. I felt nauseous all day, so while prepping for this meal, I chewed on some ginger root. Badda-bing-badda-bang....bye-bye nausea. I also love taking a lemon-ginger-cayenne shot every morning as well! I swear, it is a great way to start the day! The use of cauliflower "rice" is similar to my Moroccan Stew with Cauliflower "couscous" recipe, except I did not use a food processor this time. I did not want the texture to be as delicate, and wanted larger, rice-like peaces, so I manually grated the cauliflower to resemble more of a piece of rice. In a small pot, bring broth to a boil and add in dried shitake mushrooms. Turn off heat and let the mushrooms rehydrate in the broth for about 20 minutes, maybe 30 minutes. Dried shitakes tend to be hard and chewy if you do not let them soak long enough, so give them a try before you are done soaking. Once they are nice and soft, strain them in a collander and set aside.